RITES Deputy General Manager Recruitment 2018: This is the great news for those candidates who are looking for the Latest Government Jobs. The Department is going to recruit several posts of Deputy General Manager, Assistant Manager, Engineer, AGMetc. 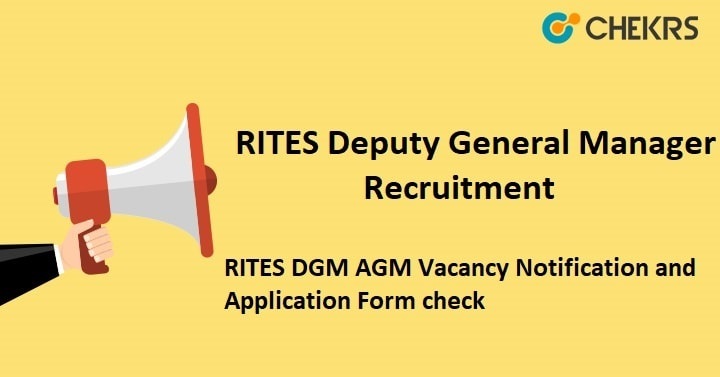 The Online Application Form of RITES Deputy General Manager Recruitment 2018 has started from 14th August 2018. Candidates can fill up the application form until 4th, 5th, 12th and 19th September 2018. The Candidate can submit a hard copy of All required documents on or before the last date through the postal address. The Eligible and interested candidates can apply for these vacancies through Official Website. Here, we are giving information RITES Recruitment 2018 Notification as Name of Posts, Number of Vacancies, Last Date of Application, a method of applying for an Application Form, Official website Link. The candidates click on “Career” button and Select “Vacancies” option. Now Complete your Registration Process. Then Login with Application Portal link. Now Send a Hard Copy of All necessary Document on Postal Address. Remarks: The Candidate wants to get information about RITES various Post, they can update with RITES Deputy General Manager Recruitment 2018 and we are providing the latest update related to upcoming Recruitment on our website that is www.jobs.chekrs.com. If you have any query about RITES Recruitment that you can write comments on commenting box and take a review or feedback.